The first very hard book this year. I started reading it on my way back from Austria in January. Then continued reading it at home. Yet I never really got into it. On the other hand, it was fascinating enough to keep on trying. Banks is a strange author. I do not know any writer whose books vary so much as his. A song of stone was just crap. The Wasp Factory fascinating. Dead air was funny and brilliant. Canal dreams entertaining. Espedair street simple but good. Walking on glass complicated. Complicity and The Business (sorry, no review, read it too long ago) were both incredibly good, but The Crow Road kept lingering. So, could be me, but it is always a surprise whenever I start a new Banks novel. Unfortunately The Bridge doesn’t live up to the expectation I had. 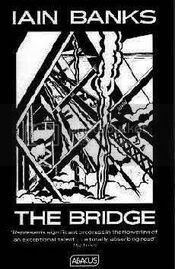 The Bridge in this novel is the whole world of a man in coma. Time and space do strange things with perception, dreams and reality, fact and fiction, everything seems to be woven into this story. Not until over halfway this book Mr. Orr, as the main character has been named until then, becomes a story. His history becomes known, slowly, gradually. Certainly not my favorite book, this one, but it certainly won’t stop me from reading more books by Banks. Whit is next, waiting on my shelf already.